This Situation Update provides information on villagers’ livelihoods, healthcare, development projects, Burma/Myanmar government military bases, and the activities of wealthy businessmen in Thaton Township, Thaton District, during the period between January and February 2015. 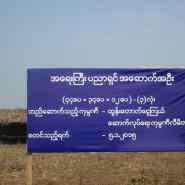 Since the signing of the preliminary ceasefire agreement, organisations such as World Concern, the Myanmar Red Cross Society (MRCS), and United Nations agencies, such as the United Nations Development Programme (UNDP), United Nations Children’s Fund (UNICEF) and United Nations High Commissioner for Refugees (UNHCR) have entered Thaton Township to conduct local development projects. Most of the projects are aimed at building schools, installing toilets, digging wells, distributing school materials, and conducting vocational training. On February 5th 2015, Tatmadaw Light Infantry Battalion (LIB) #3, led by Battalion Deputy Commander Zay Ya Win, arrived in the area to stay in A--- monastery in order to observe the activities of the local village heads. 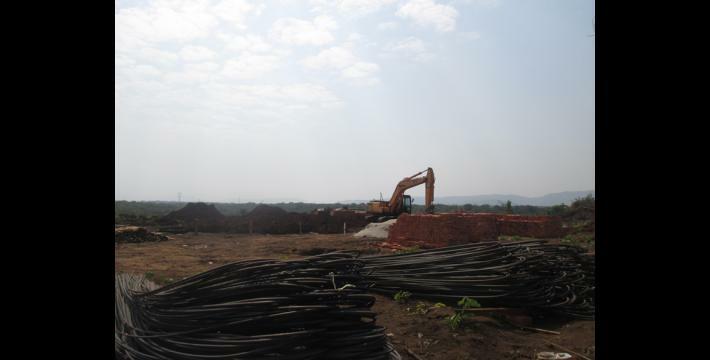 Burmese private companies have begun construction of a caustic soda factory in B--- village, Noh Ta Hsguh village tract, Thaton Township. The villagers from Hpa-an and Thaton townships gathered together and held a meeting to discuss how to regain their land that was confiscated to make way for the construction of the caustic soda factory. The following Situation Update was received by KHRG in March 2015. It was written by a community member in Thaton District who has been trained by KHRG to monitor local human rights conditions. It is presented below translated exactly as originally written, save for minor edits for clarity and security. This report was received along with other information from Thaton District, including four interviews and 77 photographs. This situation update features Tha Htoo [Thaton] Township. The mother organisation [the Karen National Union (KNU)], set up the place for us which is Tha Htoo [Thaton] Township. It is based in Mon State and is called Thaton Township as the Burma government named it this. This township is bordered by the Yangon and Hpa-an main roads [highways]. There are 13 village tracts in Thaton Township. In the 13 village tracts there are 72 villages. [There are four village tracts in Bilin Township]: Ta Rweh Hkee village tract, K’Dee Poo village tract, Khoh Tha Nay village tract, and Shway Yaw Pya village tract. 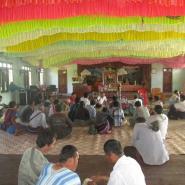 In Thaton Township the villagers are ordinary people. The main forms of livelihoods for them are cultivation and farming. 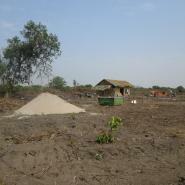 At the current time the [soil] quality of the land plantations has decreased. It [the land] therefore cannot produce food as it has in the past. They [the villagers] do not have enough food to feed their families. The numbers of farmers are decreasing. 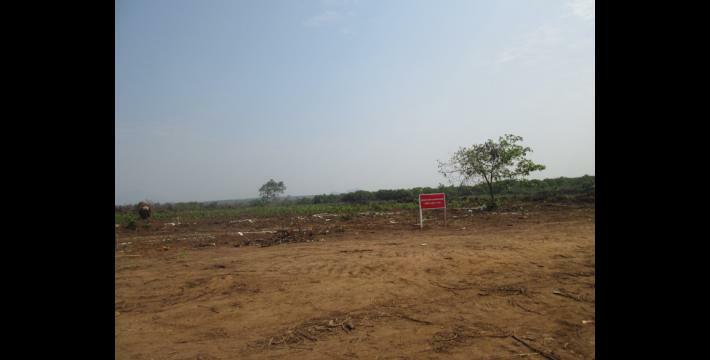 Many farms and land plantations have emptied [stopped being used as farms], therefore we have seen that they [the owners] started planting long-term plantations, such as rubber trees. In terms of hill farming, there are no more forests. Therefore they have to do hill farming in areas with no forests. Hill farming also cannot produce as much rice as before. Last year on November 5th 2014, because of unfavourable weather many paddies died. Most of the villagers have jobs in animal husbandry as there are no other businesses. They just feed and raise livestock. Apart from [the animal husbandry] business there is no huge businesses, just small shops which are set up in villagers’ houses. Some people work as day labourers. In terms of education in Thaton Township we have known that there are three kinds of schools. The first one is the villagers’ school. 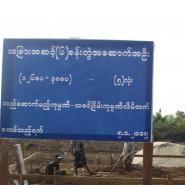 The second is a [Burma/Myanmar] government school and the third one is a religious school. There are also two kinds of teachers. The first kind are teachers which are supported by villagers and the second type are teachers from [provided by] the [Burma/Myanmar] government. Due to the ceasefire, NGOs [non-governmental organisations] and the government became active in our township and built many kinds of buildings, including schools. We know that school instruments [supplies] were provided by UNICEF [United Nations Children’s Fund]. They came to our township and provided support [with items] such as backpacks, notebooks, pens, and pencils. Currently, we have seen that many children passed through [primary or middle] school, but their parents cannot support them to continue their studies [until 10th standard]. We do not have a lot of support in terms of healthcare in Thaton Township. The people who have a strong desire to volunteer as health workers do not have strong [good] qualifications [to work as health workers]. 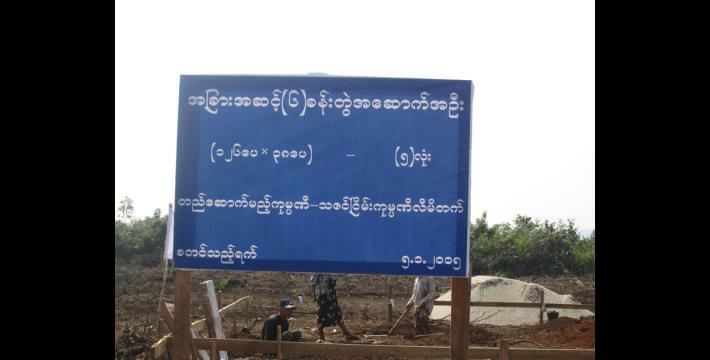 The Burma government have planned to build clinics in every village which is located on a good road because travel to the clinic will be easier. We know that the United Nations High Commissioner for Refugees (UNHCR) and Burma government officials have built clinics in almost all villages, but there are not enough health workers for each clinic. There are only a group of Backpack which is based in Ta Rweh Hkee village, Ta Rweh Hkee village tract, Thaton Township. This group has enough health workers but they cannot work in every village [because there are many villages in this township]. The NGOs active in our areas are World Concern, United Nations Development Programme (UNDP), UNICEF, Myanmar Red Cross Society (MRCS), UNHCR, Life Skill Awareness Training, and Mya Sein Yaung Village Project. We have known that World Concern came to provide water storages and wells in Neh Paw Hta village tract. UNDP came to build schools, toilets, and wells in Thaton Township. UNICEF came to provide school instruments [supplies], such as backpacks, notebooks, pens, and pencils in some villages. MRCS supports the clinics. A partner of UNHCR, Bridge Asia Japan [BAJ] came to dig the wells in almost all villages which are based in Thaton Township. Life Skill Awareness Training came to conduct vocational skills training in some areas for [to improve] livelihoods. 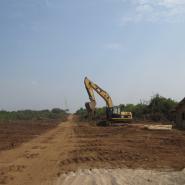 Mya Sein Yaung Village Project: the government already set up that project in some villages. 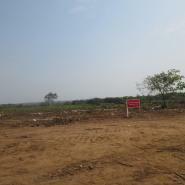 We have known that they already came to provide capital in Ta Maw Daw village tract. The villagers who take capital have to pay back the interest. The government military [Tatmadaw] who set up their headquarters in our township are Light Infantry Division (LID) #11 [based] in Nya Ta Weh; LIB #118 [based] in Thaton Myo Thit; LIB #9 [based] in Win Pa; LIB #3 [based] in Tan Ta Kyo; Infantry Battalion (IB) #8 [based] in Bilin Town Section #8; LIB #24 [based] in Du Yin Seik; Military training ground #9 [based] in A’Lan Ta Ya; Artillery #314 [based] in Zi Wan Nauk Ka Zaing; Artillery #402 based in Noh Pa Htaw; Artillery #202 Thaton Myo Thit; LIB #206 under control by LID #22 [based] in Kya Pan and their military army camp base in P’Nweh Klah village and Wee Raw village. The army camps which are located in our township are Artillery #314 based in Zi Wan Nauk Ka Zaing [army camp]; Artillery #402 based in Noh Pa Htaw [army camp]; Pa Nweh Klah army camp and Wee Raw army camp. The government military are not active like before because if we mention [look before and after the ceasefire] we can see that they were more active in the past. On September 24th 2014, we investigated [looked into finding out the] battalion numbers of an LIB and IB, but we did not know. They [the LIB and IB] are under control of LID #44 which [is] led by Major Hlaing Min. [He] came to ask permission from C--- village head to go to D--- village. The head villager did [not] let them go, but the next time when they went there they [did] not inform him that they wanted to go. The people in the area [C--- villagers] [are] responsible [for] preventing [the] government military going to that village as it is close to a KNU controlled area. They [the Tatmadaw] did ask permission before they went there but the village head did not allow them. The next time they [the Tatmadaw] did not inform the village head and went as they pleased. The villagers worry about the government military activity. In Maw Lay village tract we can also say that the government military have had more activity than in the past. From 2014 to 2015 [the military in] Ta Paw army camp, which is based in Bilin Township, are always active in E--- village. On February 5th 2015, LIB #3 which is led by Battalion Deputy Commander Zay Ya Win came to stay in A--- monastery to observe the activities of the people in the area who are responsible (i.e. village heads). They always stay in the monastery. It therefore became a worry for villagers and religious leaders. If we mention these cases we can say that [in these areas] the government military have more activities [are more active] than in the past. The purpose of the caustic soda factory is to produce papers, soaps, and other materials. 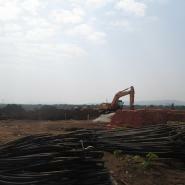 U Zaw Min Oo (assistant manager) said that he will ask the people to finish it [the factory] within three months during 2015. The above photos were taken on January 21st 2015, in B--- village, Noh Ta Hsguh village tract, Thaton Township, Thaton District. These photos show the caustic soda factory construction workers destroying the ground and plantations which were confiscated from the villagers [Photos: KHRG]. This photo was taken on January 5th 2015 in F--- village, Noh Klee village tract, Hpa-an Township, Thaton District. 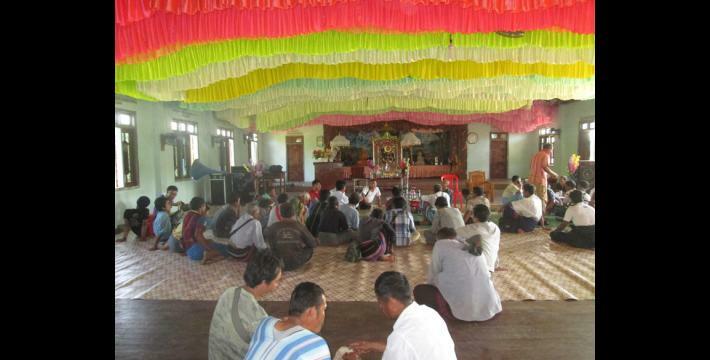 The photo shows the villagers from Hpa-an and Thaton townships gathering together in order to regain their lands which were confiscated due to the construction of the caustic soda factory. [Photo: KHRG]. 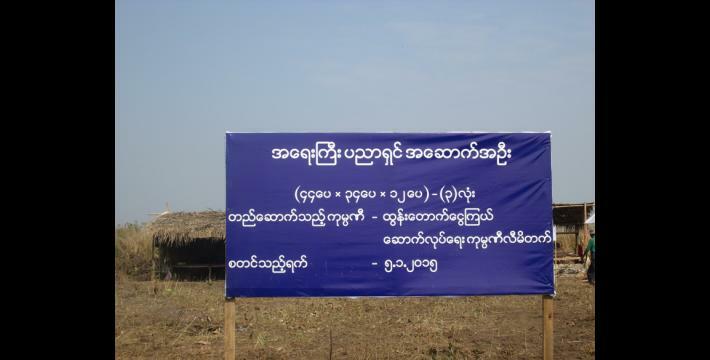 According to Burma/Myanmar government demarcations, Thaton Township is located in northern Mon State. However, according to KNU boundaries, Thaton Township, referred to as Tha Htoo, falls within Doo Tha Htoo, or Thaton District, in Karen State. This school is partly supported by the Karen Education Department (KED) who provides the school with teaching materials, while the villagers hire and support the teachers. Here the researcher means that when students finish primary education they will go to the Burma/Myanmar government school which is located in a different area. In 10th standard, you are aged around 15-16 years old. Backpack refers to the Back Pack Health Worker Team (BPHWT), who provide medical treatment for villagers in remote areas. Mya Sein Yaung is a loan initiative established by the Burma/Myanmar government to provide poorer communities access to capital. 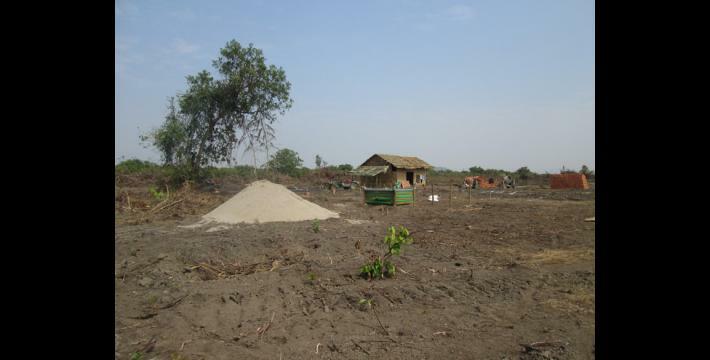 Further information on the Mya Sein Yaung project and villagers’ reaction in Hpapun District can be found in KHRG report: “Hpapun situation update: Bu Tho Township, February to June 2014,” KHRG, December 2014. 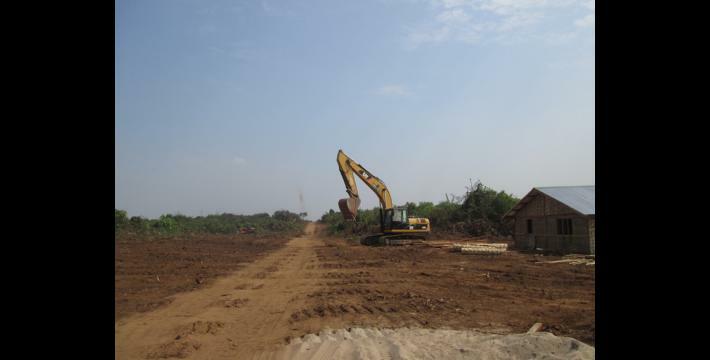 Further information on recent BAJ activity in Thaton Township can be found in the following KHRG reports: “Thaton Incident Report: UNHCR begins development project in Bilin Township, May 2014,” and “Thaton Situation Update: Bilin and Hpa-an Townships, June to November 2014,” February 2015. Artillery #402 is based in one of these three army camps but KHRG does not know which one. The Max Myanmar Company is owned by U Zaw Zaw, a well-known Burmese businessman who is involved in numerous industries, including rubber plantations, banking, gem stones, transportation, timber, luxury resorts, construction and mechanical engineering. His close relationship with the government affords him import concessions with regards to cars, motorcycles and fuel. He is also blacklisted by the US Treasury Department for his continued dealings with military and ex-military individuals in Myanmar. In 2013, the Max Myanmar Company was blocked by the Singaporean Stock Exchange Ltd. from merging with a Singaporean corporation due to these sanctions and accusations of human rights abuses in Myanmar. For his profile on the Specially Designated Sanctions List of the United States Office of Foreign Asset Control, see: Office of Foreign Asset Control, Sanctions List Search, accessed on April 25th 2015 (last updated on April 23rd 2015). For more information regarding his sanctioning, and his failed merger in Singapore, see: Edward Chung Ho, “Zaw Zaw’s Singapore Takeover Bid Hits a Snag,” DVB, April 29th 2013; for a case in this reporting period where the company continued to expand their rubber plantation at the expense of local villagers. Caustic soda, commonly known as lye, is an industrial bi-product of chlorine production usually available in granular form or in ready-made solutions of varying strengths. It has several uses from the manufacturing of paper to use in detergents. It is highly corrosive and can cause severe burns to the skin and eyes.